For other uses, see Sky Blue (disambiguation). Sky blue is the name of a colour that resembles the colour of the unclouded sky at noon (azure) reflecting off of a metallic surface. The entry for "sky-blue" in Murray's New English Dictionary (1919) reports a first sighting of the term in the article on "silver" in Ephraim Chambers's Cyclopaedia of 1728. However, many writers had used the term "sky blue" to name a colour before Chambers. For example, we find "sky blue" in A Collection of Voyages and Travels (London: Awnsham and John Churchill, 1704), vol. 2, p. 322, where John Nieuhoff describes certain flowers: "they are of a lovely sky blue colour, and yellow in the middle". The sense of this colour may have been first used in 1585 in a book by Nicolas de Nicolay where he stated "the tulbant of the merchant must be skie coloured". nomi e valori in quadricromia. For other uses, see Celeste. Celeste (Spanish: [sᵻˈlɛste], (Italian: [tʃeˈlɛste], English: /sɪˈlɛst/) is the colloquial name for the pale turquoise blue colour associated with Italian bicycle manufacturer Bianchi S.p.A and sometimes known as Bianchi Green. In Italian, as the name indicates (Celestial), it is an attempt to reproduce the colour of clear skies. In English, this colour may also be referred to as Italian sky blue. The Japanese equivalent is known as sora iro or mizudori, referring to the color of the sky or its reflection on the sea. Bleu celeste ("sky blue") is a rarely occurring tincture in heraldry (not being one of the seven main colours or metals or the three "staynard colours"). This tincture is sometimes also called ciel or simply celeste. It is depicted in a lighter shade than the range of shades of the more traditional tincture azure, which is the standard blue used in heraldry. The Italian Wikipedia cites Il dizionario dei colori: nomi e valori in quadricromia by S.Fantetti and C.Petracchi and describes multiple variants of Celeste as shown below, plus details as defined in the infobox above. Bianchi bicycles are traditionally painted celeste, also known as Bianchi Green (and sometimes, incorrectly Tiffany Blue). Contradictory myths say celeste is the colour of the Milan sky; the eye colour of a former queen for whom Edoardo Bianchi made a bicycle; and that it was a mixture of surplus military paint. The exact shade of turquoise used by the company has varied over time, but has always been described as Celeste. In Anglophone countries Celeste is sometimes reported as Pantone -#332 (Seafoam green) (or #333), and with various other shades. Displayed at right is the web colour light sky blue. It is close in shade to baby blue. Displayed at right is the colour medium sky blue. This is the colour that is called sky blue in Crayola crayons. This colour was formulated by Crayola in 1958. "Sky blue" appears in the 32, 48, 64, 96 and 120 packs of crayons. Displayed at right is the colour vivid sky blue. Deep sky blue is an azure-cyan colour associated with deep sky blue. Deep sky blue is a web colour. This colour is the colour on the colour wheel (RGB/HSV colour wheel) halfway between azure and cyan. The traditional name for this colour is Capri. The first use of Capri as a colour name in English was in 1920. The colour Capri in general is named for the azure-cyan colour of the Mediterranean sea around the island of Capri off Italy, the site of several villas belonging to the Roman Emperor Tiberius, including his Imperial residence in his later years, the Villa Jovis. Specifically, the colour Capri is named after the colour of the Blue Grotto on the island of Capri. as it appears on a bright sunny day. Today the island of Capri is a resort island popular with tourists. The colour name deep sky blue for this colour did not come into use until the promulgation of the X11 colour list in 1987. The name Capri is still used for this colour as well as the name deep sky blue. At right is displayed the colour French sky blue, which is the tone of sky blue that is called sky blue (bleu ciel) in the Pourpre.com colour list, a colour list widely popular in France. Spanish sky blue is the colour that is called celeste (the Spanish word for "sky blue") in the Guía de coloraciones (Guide to colourations) by Rosa Gallego and Juan Carlos Sanz, a colour dictionary published in 2005 that is widely popular in the Hispanophone realm. Displayed at right is the colour dark sky blue. This is the colour called sky blue in Pantone. 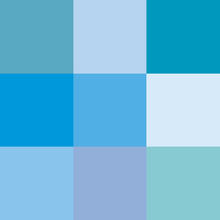 The source of this colour is the "Pantone Textile Paper eXtended (TPX)" colour list, color #14-4318 TPX—Sky Blue. Argentina: Following the colors of the Flag of Argentina, in which sky blue ('celeste' in Spanish, ) is the predominant color, many Argentine sport teams feature the color, including Racing Club de Avellaneda, Belgrano de Córdoba, Racing de Córdoba, Club Atlético Temperley, Atlético Rafaela, Villa San Carlos, Gimnasia y Esgrima de Jujuy, Gimnasia y Tiro de Salta, and Gimnasia y Esgrima de Concepción del Uruguay. In addition, the Argentina national football team is known as the 'albicelestes' due to the white-and-sky blue striping on their jerseys. This color scheme is featured in other prominent national squads in popular sports such as rugby, field hockey, polo or volleyball, to name a few. Uruguay: The Uruguay national football team has worn a sky blue jersey since 1910, after Uruguayan club team River Plate F.C. wore sky blue while defeating contemporary Argentine powerhouse Alumni Athletic Club. The national team is nicknamed 'La Celeste'. As in Argentina, a number of Uruguayan club teams use sky blue in their uniforms, such as C.A. Cerro, Club Atlético Torque, Club Oriental de Football, and Rocha F.C..
^ Cited as 1585 in Maerz and Paul A Dictionary of Color New York:1930 McGraw-Hill Page 204; Color Sample of Sky Blue: Page 89 Plate 33 Color Sample E6; the quote is from the English translation of Nicolay's Navigations, peregrinations...faicts en la Turcquie (1577). ^ Scott-Giles, C. W. (1958). Boutell's Heraldry (rev. ed.). London & New York: Frederick Warne & Co.
^ S.Fantetti e C.Petracchi (2001). Il dizionario dei colori: nomi e valori in quadricromia. Zanichelli. ISBN 8808079953. ^ Maerz and Paul A Dictionary of Color New York:1930 McGraw-Hill Color Sample of Capri: Page 93 Plate 35 Color Sample L7; The color Capri is shown as lying halfway between Cyan and Azure. ^ Type the words "Sky Blue" into the indicated window on the Pantone Color Finder and the colour will appear.